This entry was posted on Tuesday, August 19th, 2008 at 1:20 am	and is filed under Blog, Libraries, Museums. You can follow any responses to this entry through the RSS 2.0 feed. Both comments and pings are currently closed. I think you are onto something Paulie! I heard Seb talk about the possibility of doing this at the Museums Australia Futures Forum earlier this year and I’m pretty sure this is what he had in mind. I know he has been playing with it himself, but I’ve not seen the mash-up on their site yet. I’d be interested to read what he thinks. I agree: you’re definitely onto something. I think this will be very popular with all cultural institutions – and their users. I remember how popular ‘Then and Now’ calendars used to be. You’ve moved the concept into a whole new idiom, which is terrific. I think this is great. This is great. I live in a city that has every street available for “street view” (Houston, TX.) I’m betting a few techno-history people would love this for the city. I’d be curious if older street views will be made available as Google remaps cities. So many buildings are torn down in Houston I already look to Google maps to show me what is now gone. Hey buddy. Look I’m an imagineer. I’ve been one since I was a kid, so I don’t care if disney has a copyright on that one because I don’t believe in copyright anyways. Plus I like to share ideas. Sooo. What you got here is like a living memory type thing. HIstory is always in the remaking. Your helping to bridge the old-hard-to-access-type-stuff with the newer everything-is-miscellaneous digital info-media. I mean its neat that people can see what places used to look like when they go there lets say, but cooler still would be to add another layer. Stories. And not only that, now with the mobile web, or Internet of things, Dataspace, GeoSpatial Web – or what ever you want to call it, people can access that information instantly. So here is a service. I’m at a place and I take a picture of it, with my gphone or my iphone or whatever and then gps-ification and all that happens and I have access to all kinds of information – like promps that tell me additional information about that place I just took a picture of. “Holy sh.. honey did you know that this place used to be… and they used to do this to people here… ” use your imagination people. Or I can access audio clips of some dude who is now like 99 years old telling me how as a kid he used to buy ice cream at this place around the corner – and how it is still there! Think of the tourist implications as well as revealing the existing latent social capital. Word up my friend. Oh ya, there is umm this thing in New York called I believe YellowArrow and another in Toronto called Murmur – In short murmur is this – your walking down the street and you see a sign on a streetpost it says murmur and has a telephone number to call, you call and hear stories that people can record, historical and all about the location where you are standing etc. So mash it all up baby…Anyways playing with ideas, soo funnnnnn. let me know what you think, there is so much more where that came from. That bridge is not the Pacific Hwy Bridge, it is the original railway bridge near Brooklyn. The bridge was demolished in the 1940s but the pylons remain. 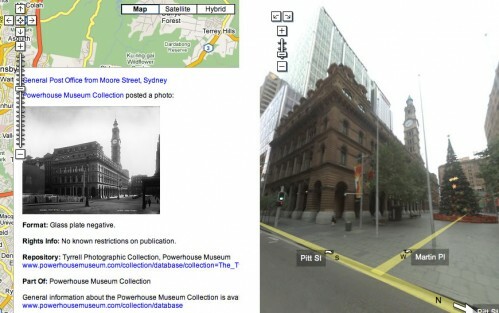 As an alternative to Street View, when that is not available, why not do a link to hybrid view in Google Maps. Steven, thanks for the information. I’ll pass it on to the Powerhouse for their records. That’s a good idea about linking to the hybrid view, I’ll add that in. I found this site, hoping that someone had developed a google layer for now and then photos :). I use this with interactive whiteboard software by overlaying the second image then gradually making it more transparent to reveal the first. I’d love it if this mashup would be developed!